Y’all are in for a treat today. I have more desserts to share today, Thursday, and Friday, so keep coming back for some yummy additions to your fall and Christmas dessert spreads! First, I have to start with a little situation control. I hate to have to even say this, because so many of you have been with me and supported me since the early months of Healing Cuisine. I have seen many folks posting my recipes AND my pictures online without my permission and without a backlink. My work and content (and any blogger’s work) is copy written, protected under the Creative Commons License. Please do not copy and past my recipes onto your Facebook wall. Please do not take the pictures from my website. At the very least, please put a backlink to the original page where you found the recipe. What I would most prefer is that you use the SHARE button on the Healing Cuisine Facebook page to share my content with your friends. If you would like to use my recipes or articles in any capacity outside of your own kitchen, please email me first to get permission. I appreciate your respect and understanding. Okay, moving on to sharing a fabulous recipe shared with me by a fan! This Guest Recipe comes from Janis Storring of Ontario, Canada. Her recipe for Homemade Oreo Cookies really hits the sweet tooth. She uses walnut flour, and I’ve got to say I do like the flavor of the ground walnuts in the chocolate cookie. I have tried these with almond flour, too, and they turn out just fine. I also made a batch using 2 Tablespoons of honey and 1/4 cup xylitol (instead of 1/2 cup xylitol) and I really liked thedm! The little bit of sugar from the honey allows the cookies to crisp up a bit and hold their crunch (the same method used in my Snickerdoodle Cookies recipe). Because of the lack of sugar/gluten, nut flours will get soft or soggy shortly after cooling from the oven. It’s up to you if you’d like a crunchy cookie or soft cookie texture. To cut the perfect circles, invest in some quality cutters, or use the rim of a glass or coffee mug. 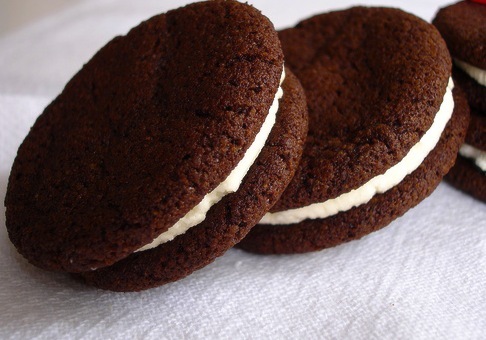 These oreo sandwiches depend on uniform cookies. Janis likes to switch up her oreo cookie fillings. The options are really endless! You can do ice cream filling, add avocado/chlorophyll and pure mint essential oil for minty creme, swirl in peanut or almond butter, add almond extract and some chopped cherries, or stir in pureed berries! Thank you, Janis, for sharing your oreo cookie recipe with us!! 1.) COOKIES Preheat oven to 325 degrees F and line baking sheet with unbleached parchment paper. In a food processor, pulse together walnut flour, cocoa powder, baking soda, baking powder, sea salt and xylitol until combined. Add butter and pulse until small crumbs form. Add the egg, ground flax, and protein powder. Pulse until the dough comes together and pulls away from the sides of the food processor. 2.) Lay a sheet of unbleached parchment paper out on a counter or table. The dough is a bit sticky, so the paper helps. You may also wish to chill the dough in the fridge for 15 minutes before rolling out. Scoop the dough onto the parchment. Flatten it out a bit with your fingers to get started. Lay a second sheet of unbleached parchment paper on top of the dough. Use a rolling pin to roll the dough to about 1/4 inch thickness. Remove the top parchment layer and begin cutting your cookie circles. Any size diameter you prefer is fine, but I like using the 2 or 2 1/2 inch circles for a more authentic Oreo. Use a thin cookie spatula to lift the cut circles onto the lined baking sheet. Repeat the process until all dough is cut. 3.) Bake at 325 degrees F for 10 minutes. Cool completely. You may find it helpful to freeze the cookies, too, before filling. 4.) CREME FILLING In a mixing bowl with the paddle attachment, beat butter and coconut oil together until fluffy. Add powdered xylitol and vanilla. Continue to beat until the icing is light and fluffy. Spoon creme into an icing bag or plastic bag and cut off one corner. Squeeze creme in an even layer onto one cookie and top with another one. Store in fridge or freezer until ready to eat. Ah, nothing like old times. Remember the days when your parents would sit you down at the kitchen table and prepare a plate of oreo cookies and a glass of milk? They’d smile and watch you eat knowing full well you deserved such a scrumptious snack. We’ll just ignore the unusualness of that situation and focus on their intentions that being, to watch their child (you, of course) enjoy a tasty dessert for such a hard working performance concerning your school grades. This is when mom or dad would sit down and dip cookies in the milk with you. Parents and children happily eating cookies together. You know those commercials you see on TV aren’t far from the truth- there really *is* somewhat of a family gathering when it comes to cookie-dipping milk scenarios. Cherish them. Where might i find walnut flour? Can i make my own? If so, how would i do that? You can find walnut flour at Nuts.com. Or make your own by grinding down raw walnuts in a food processor, VitaMix blender, or clean spice grinder. You can also substitute almond flour for the walnut flour. Enjoy! So i gound my flour! Now i am having troubles w/the dough. It’s too sticky to put parchment paper on top of it. I cannot even cut it out. Not sure why. I followed the recipe to a “T”. Hi Shannon, Work in a little more walnut or almond flour until you can handle the dough. Just made these, & they are AWESOME! Sorry–I’m still learning. What exactly is “coconut oil, solid form”? The coconut oil I buy in a jar usually is about 2/3 liquid with some solid at the bottom of the jar. Is it that solid part you’re talking about, or should I be looking for an entirely different product? Thanks! Hi Maggie! Coconut oil in solid form is the opaque white form coconut oil takes when at about 70 degrees or below. For this particular recipe, it’s important to have it in solid form to help make the creamy middle to fill the cookies with. Coconut oil in liquid form is the melted coconut oil or the form coconut oil takes when heated over about 70 degrees. Hi Elise–Thanks for the quick response! I don’t refrigerate my coconut oil, but if I did, I imagine the whole jar would be solid. Could I use that in the recipe? Yes, I’d put it in the fridge for a couple hours, then pull out to thaw for about 1 hour after. The texture you’re looking for should be opaque white but able to smoosh your finger into it down to your first knuckle. These look amazing! However, I do not like the after taste of the xylitol. What can I do to replace that ingredient?